Clinton Memorial by Henry Kirke Brown, 1855, at Green-Wood Cemetery, Brooklyn, New York. DeWitt Clinton (March 2, 1769 – February 11, 1828) was an early American politician and naturalist who served as a United States Senator and was the sixth Governor of New York. In this last capacity, he was largely responsible for the construction of the Erie Canal. Clinton was the leader of New York's People’s Party and was a major rival of Martin Van Buren, who was the Attorney General of New York during Clinton's governorship. Clinton believed that infrastructure improvements could transform American life, drive economic growth, and encourage political participation, and he heavily influenced the development of the New York State and the United States. 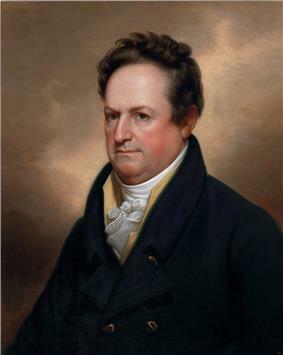 Gubernatorial portrait of DeWitt Clinton. DeWitt Clinton was the second son born to Democratic-Republican Party. He was a member of the New York State Assembly in 1798 and of the New York State Senate from the Southern District from 1798 to 1802 and from 1806 to 1811. He was a delegate to the New York State Constitutional Convention in 1801. He was a member of the Council of Appointments in 1801–1802 and 1806–1807. He won the American Academy of the Fine Arts in 1808 and served as its president between 1813 and 1817. He was Regent of the University of New York from 1808 to 1825. He was married twice. On February 13, 1796, he married Maria Franklin, daughter of the prominent New York Mayor of Buffalo, New York, 1842–1843. 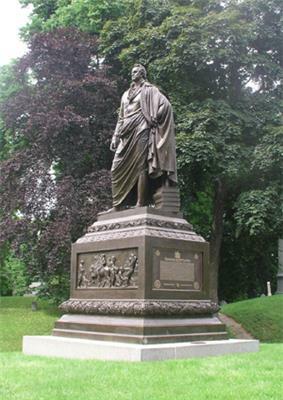 From 1810 to 1824, he was a member of the Erie Canal Commission. He was among the first members, appointed in 1810, who projected and surveyed the route to be taken. After 1816, he became the driving force during the construction of the canal. 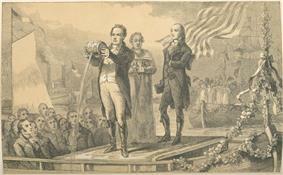 Print showing DeWitt Clinton mingling the waters of Lake Erie and the Atlantic, 1826. In 1811, the death of John Broome left a vacancy in the office of Lieutenant Governor of New York. In a special election, Clinton defeated the Federalist Nicholas Fish and the Tammany Hall candidate Marinus Willett, to become Lieutenant Governor until the end of the term in June 1813. In 1812, Clinton ran for President of the United States as candidate for both the Federalist Party and a small group of anti-war Democratic-Republicans. In the close election of 1812, Clinton was defeated by President Madison; Clinton received 89 electoral votes to James Madison's 128. It was the strongest showing of any Federalist candidate for the Presidency since 1800, and the change of the votes of one or two states would have given Clinton the victory. After the resignation of Governor Tompkins, who had been elected Vice President, he won a Governor of New York. 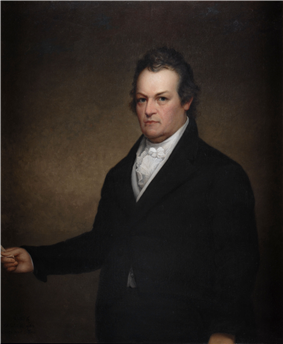 He was re-elected in 1820, defeating the sitting Vice President Tompkins in a narrow race – DeWitt Clinton 47,447 votes, Tompkins 45,900 – and served until December 31, 1822. During his second term, the New York State Constitutional Convention of 1821 shortened the gubernatorial term to two years, and moved the beginning of the term from July 1 to January 1, actually cutting off the last 6 months of the 3-year-term he had been elected to. Also the gubernatorial election was moved from April to November, but Clinton was not renominated by his party to run for re-election in November 1822. Even so, he still kept his post as President of the Erie Canal Commission. In April 1824, a majority of his political enemies, the Bucktails, voted in the New York State Legislature for his removal from the Canal Commission. This caused such a wave of indignation among the electorate, that he was nominated for Governor by the "People's Party", and was re-elected governor, against the official candidate of the Democratic-Republican Party, fellow canal commissioner Samuel Young. He served another two terms until his sudden death in office. Clinton was a  Clinton was also essential in establishing the Grand Encampment of Knights Templar in the United States, serving as its first, second, and third Grand Master from 1816-1829. When DeWitt Clinton died suddenly in Albany on February 11, 1828, he left his family in poor financial condition. While Clinton was a fine administrator in government, he had handled his own financial affairs rather poorly. As a result, the Clinton family was badly in arrears and had no means of support after the governor’s death. One creditor alone put in a claim for $6,000. Fearing that he might not get his money, the creditor obtained a judgment that resulted in a public sale of most of the Clinton family possessions. Enough money was realized from the sale of the property to satisfy the judgment, but nothing was left to help the Clinton family through the difficult years ahead. Although the governor received the grandest of state funerals, when it was all over, the family had no place to bury him. His widow was completely without funds to purchase a suitable gravesite. As a result, Clinton’s remains were placed in the family vault of Dr. Samuel Stringer (1735-1817), an old friend and fellow Mason from Albany, in the old Swan Street cemetery. Sixteen years later, enough money was collected to provide a suitable burial. On June 21, 1844, a newspaper in Albany printed this small announcement: "The remains of DeWitt Clinton, which had been deposited in the cemetery in Swan Street, were removed to New York for interment under a monument created by the family." Clinton was re-interred at the Green-Wood Cemetery in Brooklyn, New York. Clinton was able to accomplish many things as a leader in civic and state affairs, such as improving the New York public school system, encouraging steam navigation, and modifying the laws governing criminals and debtors. The 1831 DeWitt Clinton locomotive was named in his honor. The community of Whitestone, New York, was for several decades after his death known as Clintonville, but reverted to its traditional name; however, the governor is memorialized to this day by Clintonville street, a major local road. While governor, Clinton was largely responsible for the construction of the Erie Canal. He was persuaded by Canal proponent Jesse Hawley to support construction of a canal from the eastern shore of Lake Erie to the upper Hudson River. Many thought the project was impracticable, and opponents mocked it as "DeWitt's Ditch". But in 1817, he got the legislature to appropriate $7,000,000 for construction. When the Canal was finished in 1825, Governor Clinton opened it, sailing in the packet boat Seneca Chief along the Canal into Buffalo. After sailing from the mouth of Lake Erie to New York City he emptied two casks of water from Lake Erie into New York Harbor, celebrating the first connection of waters from East to West. The Canal was an immense success, carrying huge amounts of passenger and freight traffic. The cost of freight between Buffalo and Albany fell from $100 to $10 per ton, and the state was able to quickly recoup the funds it spent on the project through tolls along the canal. The completion of the canal brought about a significant shift in public opinion on Clinton, who was now hailed for completing the canal. This change in public opinion was reflected in the newspapers of the time. Previously being filled with harsh criticisms of Clinton and the canal, they now celebrated his accomplishment. For example, an article in the New Hampshire Sentinel began saying, “The efforts of Gov. Clinton to advance the best interest of the State over which he presides are very generally acknowledged both by his constituents and the public abroad. His exertions in favor of the great Canal have identified his name with that noble enterprise, and he will be remembered while its benefits are experienced,” and ended with “Yield credit to Clinton, and hail him by name". 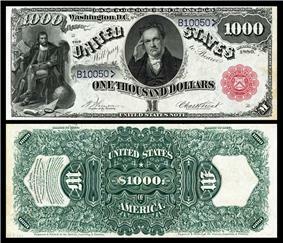 An engraved portrait of Clinton appeared on the Legal Tender (United States Note) issue of 1880 in the $1000.00 denomination. An illustrated example can be found on the website of Federal Reserve Bank of San Francisco's "American Currency Exhibit". Castle Clinton, Manhattan, New York. Former US Army fort and America's first immigration processing center. Ted DeWitt Clinton, a character from the animated series Daria. DeWitt Clinton Park, Manhattan, New York City. The neighborhood around it, Hell's Kitchen, has also become known as Clinton, or the Special Clinton District (a City Government preservation zone) in recent years. Clintonia borealis also known as Clinton's Lily. ^ Edwin G. Burrows "Little Short of Madness," American Heritage, Winter 2010. ^ "Masonic Service Awards". Grand Lodge of New York. Retrieved 2011-11-06. ^ "Past Ge Officers". Knightstemplar.org. Retrieved 2013-07-25. ^ John Steele Gordon "10 Moments That Made American Business," American Heritage, February/March 2007. ^ Hemmerly, Thomas Ellsworth (2000). Appalachian Wildflowers. University of Georgia Press. p. 122.